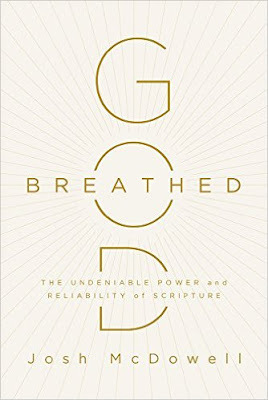 Disclosure: I received God Breathed: The Undeniable Power and Reliability of Scripture by Josh McDowell complimentary from Family Christian. Provided I give an honest review. I found reading God Breathed to be quite interesting. The author first explains how he didn't believe the Bible was historically reliable, and states how he was on a journey to find proof it wasn't. But during his research he came to know and believe in God. I think that is amazing how God can work in our lives like that. This research McDowell started made him want to find more of the actual documents of the Bible. He wanted to share with the world what he discovered. God Breathed is great for those of you who enjoy reading about the history of the Bible. McDowell has a lot of facts about the different languages it was written in and also why God used so many different authors for the Bible. The cover of this book is simple but pretty. It is one of the reasons I wanted to read it. I do believe I would have enjoyed it more, if I knew it had a study guide to go along with it. Whenever I decide to read it again, I will have to purchase the study guide to read with it. Sometimes it helps me learn better and stay more focused. Here is a LINK to where you can purchase this book for yourself. Have a Blessed Day! "God said, ‘Let there be. . .’ ” And when God spoke, things happened. Recapture the awe, the mystery, the passion and power of scripture in God-Breathed—where you’ll personally experience a life transformed by the One who spoke everything into existence, including you. Ty For Commenting :D I do love me some nonfiction also!